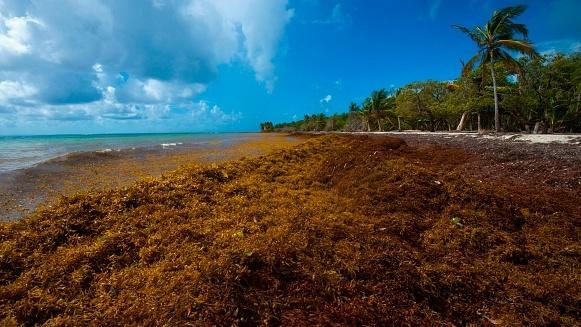 A picture taken in April shows sargassum seaweed on the French Caribbean Island of Guadeloupe. Beachgoers make their way through seaweed in July in Sunny Isles Beach, Fla. The brownish looking seaweed variety is called sargassum and is flooding the shores of South Florida this year. "It's pretty nasty. It's got a pretty strong odor. It's really affected by the tides," he says. "When the tides start changing it gets active again in the water and on the beach as well. So it's definitely an irritant." Every day on Miami Beach, sanitation crews are out early to remove the seaweed from the beaches. By midday, sargassum weed is back. Ann Spiller was there for a day at the beach with friend Andre Ruiz. She says the local economy is dependent on tourism and the seaweed is a headache. "We both work in hospitality and we deal with hotel guests all the time," Spiller says. Hotel guests often ask them to go out to the beach and clean it up, but there's little they can do. In Barbados, Hazel Oxenford says sargassum is more than a headache, it's a national emergency. Oxenford, a fisheries biologist at the University of the West Indies, says the seaweed piles up on the shoreline there 10 to 12 feet high. Even worse, she says, masses of the weed cover the water near the beaches. "It creates tremendous problems for the natural ecosystems," she says. "We've had significant loss of endangered sea turtles that have actually drowned because they can't get to the surface because the sargassum above them is so high." Sargassum is a free-floating weed that forms large mats and is moved by wind and ocean currents. A massive bloom is now appearing almost every year in the tropics, causing big problems for islands dependent on fishing and tourism. In Barbados, the government has mobilized the military to aid in the cleanup. On Antigua, large amounts of the seaweed have forced the closing of at least one hotel. In Mexico, Grenada and most other Caribbean destinations, local officials and hotel operators are struggling to clear beaches, often using backhoes and other heavy equipment. "Sargassum had always been present in the Caribbean," says Jim Franks, a marine biologist at the University of Southern Mississippi, "but never in such large quantities." Franks added that 2011 was the first big year. When large mats first appeared in the Caribbean, many thought it was from the Sargasso Sea, an area in the Atlantic north of the Caribbean. But Franks and other researchers traced the seaweed to a massive bloom that has appeared off the coast of Brazil. Ocean currents carry the seaweed up the South American coast into the Caribbean, where Franks says the impact on fisheries has been catastrophic. "Fishermen, the fishers are having difficulty getting out to fish because it's filling up their bays, marinas and harbors," he says. "It's difficult for them to get through that stuff to fish offshore." Researchers say more work needs to be done to identify exactly what's causing the massive seaweed bloom. According to Hazel Oxenford, an obvious factor is the large amounts of nutrients being dumped into the ocean by farming and development worldwide. "We're talking about mass increase in nutrient levels from deforestation in the Amazon, from urbanization in the Congo," she says. "Plus climate change, particularly an increase in surface water temperatures. Because the two things that plants or this floating seaweed will respond to is an increase in nutrients and an increase in water temperature." Using satellite imagery, researchers at the University of South Florida have been able to monitor and track the massive growth and the movement of sargassum. Mengqiu Wang, a postdoctoral researcher at USF's College of Marine Science in St. Petersburg, says for islands and coastal communities, it's important to know where the masses of seaweed are headed. "Because in that way," she says, "people can make preparations ahead of time." Researchers and government officials in the Caribbean say sargassum inundations are a new type of natural disaster. Like hurricanes, once they develop, there's nothing you can do to stop them. All governments can do is mobilize people and equipment beforehand and respond quickly once they hit. If you've been to a beach this summer anywhere from Texas to the Carolinas, you've likely seen it - masses of brown seaweed, sometimes a few clumps, often big mounds lining the shore. In many areas in the Gulf and the Caribbean, it's more than a nuisance; it's a natural disaster. Scientists say a massive bloom of sargassum weed has been appearing almost every year in the tropics. NPR's Greg Allen reports it's causing problems for islands dependent on fishing and tourism. GREG ALLEN, BYLINE: On Miami Beach recently, Mike Berrier was enjoying the sun and the water despite the sargassum weed. MIKE BERRIER: It's pretty nasty. I mean, it's got a pretty strong odor. It's really affected by the tides. It kind of lays dormant for a while, but then when the tides start changing, it gets very active again in the water and on the beach as well. So it's definitely a irritant. ALLEN: Every day on Miami Beach, sanitation crews are out early removing the seaweed off the beaches. By midday, sargassum weed is back. Ann Spiller, out for a day on the beach with friend Andre Ruiz, says for a local economy dependent on tourism it's a headache. ANN SPILLER: We both work in hospitality. And we deal with the hotel guests all the time like, hey, can you go - just go out on the beach and, like, put it away for us, like, remove it? And we're like, we can't do anything about it. ALLEN: In Barbados, Hazel Oxenford says sargassum is more than a headache; it's a national emergency. Speaking over Skype, Oxenford, a fisheries biologist at the University of the West Indies, says the seaweed piles up on the shoreline there 10 to 12 feet high. HAZEL OXENFORD: And then it backs off and is held in the water offshore. And that's when it creates tremendous problems for the natural ecosystems. And we've had significant loss of endangered sea turtles that have actually drowned because they can't get to the surface because the sargassum above them is so high. ALLEN: Sargassum is a free-floating weed that forms large mats and is moved by wind and ocean currents. In Barbados, the government has mobilized the military to aid in the cleanup. On Antigua, large amounts of the seaweed have forced the closing of at least one hotel. In Mexico, Grenada and most other Caribbean destinations, local officials and hotel operators are struggling to clear beaches, often using backhoes and other heavy equipment. JIM FRANKS: Sargassum had always been present in the Caribbean, you know, but never in such quantities. And 2011 was the first big year. ALLEN: Jim Franks, a marine biologist at the University of Southern Mississippi, says at first many thought the seaweed was from the Sargasso Sea, an area in the Atlantic north of the Caribbean. But a few years ago, Franks and other researchers traced the seaweed to a massive bloom that has appeared nearly every year since 2011 off the coast of Brazil. Ocean currents carry the seaweed up the South American coast into the Caribbean, where Frank says the impact on fisheries has been catastrophic. FRANKS: Fishermen, the fishers, are having difficulty getting out to fish because it's filling up their bays and marinas and harbors. It's difficult for them to get through that stuff to get out to fish offshore. ALLEN: Researchers say more work needs to be done to identify exactly what's causing the massive seaweed bloom. Oxenford says an obvious factor is the large amounts of nutrients being dumped into the ocean by farming and development worldwide. OXENFORD: From deforestation in the Amazon, from urbanization in the Congo plus climate change, particularly an increase in the surface water temperatures because the two things that plants or float - this floating seaweed will respond to is an increase in nutrients and an increase in water temperature. ALLEN: Using satellite imagery, researchers at the University of South Florida have been able to monitor and track the massive growth and the movement of sargassum. Mengqiu Wang, a researcher in the College of Marine Science in St. Petersburg, says for islands and coastal communities it's important to know where the masses of seaweed are headed. MENGQIU WANG: Because in that way people can make preparations ahead of time. ALLEN: Researchers say sargassum inundations are natural disasters. Like hurricanes, there's nothing you can do to prevent them. All governments can do is mobilize people and equipment beforehand and respond quickly once they've hit. Greg Allen, NPR News, Miami. Transcript provided by NPR, Copyright NPR.